“The Messenger” uses chanting male vocals to start off both the album and this intro track, wherein the voice of the White Queen (played by Christine Filipak) tells of a magical winter season. “Frozen Memories” evokes a nostalgic feeling through tolling bells and light touches that remind me of ice crystals. The medium piano and light chimes of “Magic and Moonlight” make me think of nighttime and wonder, with a pinch of magic. Some aspects of this also remind me of The Nutcracker. String work defines both “The Rose of Winter” and “Enchanted Realm,” although that last one is heavier and has more light touches. 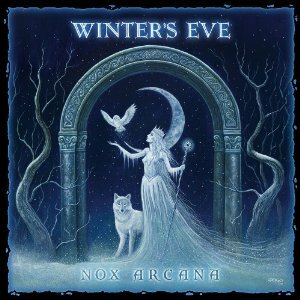 “The Ides of December” uses a speedy, heavy piano along with female vocals and magic-sounding light touches. It becomes hauntingly beautiful at the times it slows in both speed and tone. The name “Gifts of the Magi” makes me think of both the three wise men and the story by O. Henry, although the Middle Eastern drums and percussion make the inspiration for the song clear. “Season of Wonder” uses a piano, along with light touches and female vocals to create a dreamy feel. The string and ye olde tambourine work of “Solstice Dance” conjures up images of a medieval ball. “Pax Terra,” which translates as “Peace on Earth.” Although their work in the last album could be made to seem scary, this can’t. “Winds of Change” initially utilizes a harpsichord to provide a feeling of antiquity before letting other instruments creep in (perhaps signifying change). The light, slow piano work of “Fading Embers” will assuredly bring to mind a dying fire in the hearth at a party or waiting for St. Nicholas to arrive. As the name suggests, “Crystal Chimes” uses light chimes, along with distant tolling bells and vocals that go well with the winter fantasy theme. The peaceful and festive “Serenity” is a great piece of medieval-sounding music. “Winter Rhapsody” uses a medium piano and heavy touches to evoke the alternating beauty and fury of winter weather. The piano and musicbox-like chimes of “Time Slips Away” remind me of the distant memories of childhood, which the winter weather seems to bring out in all of us at times. Those who patiently wait will get a hidden bonus, which includes more musicbox-like chimes and wintery wind.